Welcome to the Pleasure Dome – The Jeff Noon Interview! With his feather-frazzled early fictions (Vurt, Pollen, Automated Alice and Nymphomation),Jeff Noon presented the world with a distinctly British (no, wait – English!) version of cyberpunk – one that side-stepped all those designer shades and phallic head jacks in favour of something that was a little bit less ashamed of its fantastical status. In his short stories (Pixel Juice, Cobralingus) and transitional ode to musical Manchester Needle in the Groove, Noon drifted even further from traditional modes of science fiction, working to match the ever-adapting techniques of then-contemporary electronic music and – inCobralingus – offering a “how to” guide to the curious reader in the process. Until recently, 2002′s Falling Out of Cars looked like it might be the last Jeff Noon novel. If the fractured mirror landscape of the book often proved to be as startling and dissociative for the reader as they were for the characters then that was probably a feature rather than a bug – Falling Out of Cars made the fact that all of Noon’s adventures in wonderland had been tainted by life on this side of the mirror horribly clear. This notion was always there in Noon’s work – no amount of strain is going to make a looking glass show something that isn’t already here waiting to be reflected, after all – but in Falling Out of Cars it became inescapable. This made the subsequent absence of a “new Jeff Noon novel” seem more explicable, if still somewhat tragic – what better note for an author to stop writing on than this, a story about people whose very ability to comprehend the world and words around them was slipping away. There were some signs of writerly life though, like 2008′s 217 Babel Street – a collaborative hyperlink fiction the served as the real world scaffolding on a fictional location – and 2012 has seen Noon’s strange pollen corrupting the air stream on a previously inconceivable scale. Noon’s endlessly imaginative twitter account is one of the best follows out there for those in a Mindless frame of mind, and if his microfictional “spore” fictions leave you craving more there’s always the echovirus12 account, to which Noon also contributes. 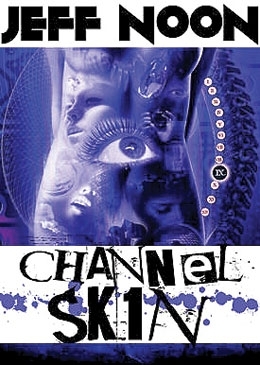 For those who like their fiction to occupy a more traditional form, there’s also a new novel,Channel SK1N, the story of a pop star who finds her skin overridden by the signals all around her as she transforms in a way that blurs the line between broadcaster and receiver. I’ve only just finished reading the book, and I hope you’ll forgive the ecstatic tone of this introduction because Channel SK1N combines the lysergically enhanced rush of Noon’s early fiction with the queasy comedowns of his later work, and in doing so reaffirms sci-fi’s status as the best tool available to writers who want to explore a future that’s here somewhere, already hidden.